After Carolyn Carlson and Sasha Waltz, Ascona is all set to play host once again to another choreographer who has written their own page in contemporary dance, with a world premiere in which Susanne Linke presents progressive sequences of movement and interaction between feelings and body sensations. 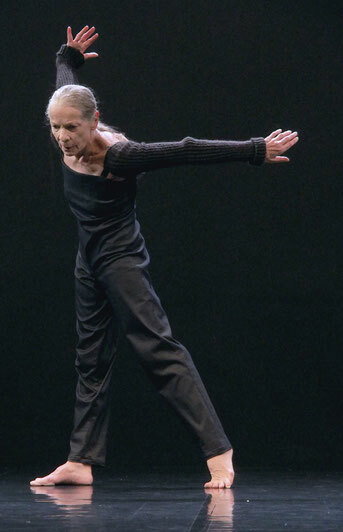 Susanne Linke learned dance with Mary Wigman in Berlin before studying at Essen Folkwang Hochschule and becoming a Folkwang Dance Studio dancer, under artistic director Pina Bausch. From the mid-1980s, she embarked on an international career as a soloist dancer and choreographer. In the early 1990s, she became the Artist in Residence at Berlin´s Hebbel Theater (now HAU Hebbel am Ufer). Between 1994 and the year 2000, she was director of dance theatre at Bremen Theater. In 2000/01, she was a co-founder of the Choreographic Centre Essen, and also artistic director. Since 2001 Susanne Linke has been working as an independent choreographer and dancer. From the 2015/16 season, Susanne Linke is artistic director of the dance Department of Trier Theater. A person comprising individual, strongly divergent parts which do not fit together. On the outside, calm and controlled; within, a tumult of conflicting feelings and interests. With this title, Thalamus, it is highly likely that that part of the brain called "the threshold of awareness" may refuse to carry out its responsibilities. Regardless of such a clinical finding, Urs Dietrich demonstrates in this solo, a typical, generic example of dismay. In the third part of the piece, inner conflict leads to passion; the character, quite literally, let´s go, for good or ill. Let the stream take you or give up and resign yourself to your fate. Open ending. The themes of Urs Dietrich, choreographer and dancer, are critical reflections on our time in a visual language, which as it increases in intensity, develops a poetry of space. Since the early 1980s, Urs Dietrich has created numerous solos and group pieces, from the basis of the tradition of dance-theatre and German expression of dance. Born in 1958 in Visp, Switzerland, he began with studies in textile design. From 1981 to 1985 he then studied dance at Essen Folkwang Hochschule and later in New York. In 1988 he began working independently as a dancer and choreographer, performing on tour throughout Europe, Asia, India, and North and South America. Solo works such as "Heart chambers", or "At the borders of the day", were produced by the Berlin Hebbel Theater.